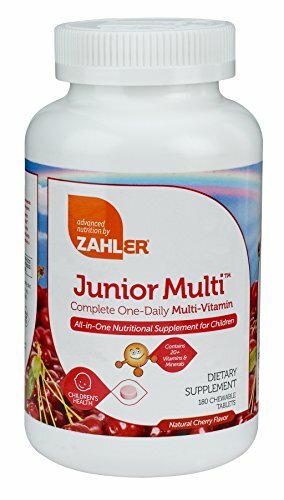 Zahler's Junior Multi chewable multivitamin for kids, this kids multivitamin is chock full of critical vitamins and minerals to fill in the gaps of the most prevalent nutritional deficiencies. great tasting childrens multi. As nutritional deficits that occur during a child's formative years have both immediate and lifelong consequences.With an advanced blend of essential vitamins and nutrients recommended by today's leading researchers, Junior Multi contains the right combination to give growing children the nutritional boost they need to maintain a healthy mind and body. Junior Multi contains twenty-three essential vitamins and minerals in a delicious tasting, all natural cherry flavored tablet. If you have any questions about this product by Advanced Nutrition by Zahler, contact us by completing and submitting the form below. If you are looking for a specif part number, please include it with your message. Natures Way Alive Childrens Natural Orange and Berry Multi-Vitamin Chewable Tablet, 120 per unit - 1 each.